Severe storm and gales, several ships wrecked, flooding throughout Canterbury, Waimakariri River overflows into the Avon causing serious flooding, and water flows a metre deep in Market Square – 2016? No February 4 1868 – 150 years ago! Originally known as Market Square or Market Place, Victoria Square was the commercial hub of early Christchurch. Just look around you and imagine a Post Office and markets as well as the Police Station, Women’s Prison, animal pound, work stores and Immigration Barracks. Victoria Street, until 1983, cut through Victoria Square on a diagonal connecting it to Colombo Street and was an essential traffic route which provided a direct link to the Papanui Bush, essential as a timber and firewood source for the early settlers. A traffic count in 1862 showed that in one single day 1,000 pedestrians, 58 bullocks, 316 horses and one donkey had used the old wooden bridge which was replaced in 1864. This bridge, there today, erected to cope with the traffic flow, was built in iron and stone and is one of the earliest of its kind in New Zealand. In 1989 it was renamed the Hamish Hay bridge. In 1897 the area was cleared and developed as a park for Queen Victoria’s Diamond Jubilee. The name change from Market Square to Victoria Square came 115 years ago in 1903. Radical Christchurch to the fore in 1909 when the government passed the Defence Act – this provided for compulsory military training. The Christchurch City Council systematically prosecuted people who engaged in street corner oratory against the Act, and anti-militarists staged free-speech fights. On one night in September 1912 a captured South African field gun was unbolted from its position here in Victoria Square, painted red and rolled into the river. The Square was remodelled in 1989 and this makeover was one of the city’s most successful enhancement for the design was recognised by the New Zealand Institute of Landscape Architects winning its highest award. It is for this reason that public vigilance campaigners for ‘Victoria Square - No Need for Change’ launched a successful offensive to stop the Canterbury Earthquake Recovery Authority from making radical changes to a much loved area. However, this was not the first protest launched in living memory to protect Victoria Square. Perhaps the most extravagant project of the 1980s was the proposal to erect a 187 metre high tower to cost $20million, at the corner of Colombo and Armagh Streets on Victoria Square land. At first the Council supported the proposal because of the potential for job opportunities and tourism. But environmental and civic groups were so outraged at the proposal their successful campaign led to the Council rescinding their decision. There are three significant heritage items in the square as well as the six metre high Maori carving unveiled in December 1994. The carving was initiated by the Christchurch City Council in conjunction with Ngai Tahu as a 1990 project commemorating the signing of theTreaty of Waitangi. The Poupou, 6m high, was carved by master carver Riki Manuel from a totara trunk given by a West Coast farmer. The main theme of the poupou is mahinga kai or food resources and it also depicts tipuna or ancestors of the Ngai Tahu Waitaha people. The heritage listed Queen Victoria and Captain Cook statues both have inscriptions which explain why they are there. Queen Victoria currently stands only 50 metres from its original site and was erected to commemorate the Golden Jubilee of the founding of the Canterbury settlement (50 years from 1850 = 1900), a memorial to those soldiers of Canterbury, 79 of them, who were killed in the South African War (1900-1902), the foundation stone was unveiled in 1901 by the future King George V.
The Captain James Cook statue was unveiled in 1932 by the Governor General Lord Bledisloe in 1932. It was gifted to the city by M F Barnett. 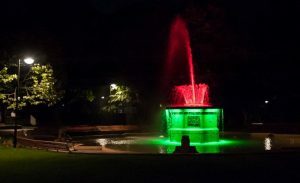 And the H L Bowker fountain – the first illuminated electric fountain in Australasia was gifted by Henry Bowker, a city businessman whose office overlooked Victoria Square. The fountain is on the site of the former animal pound. So Victoria Square has had a colourful history, pre and post European settlement. It was a favourite food gathering place for Maori, it was the centre of the city in early settlement times and it was the birthplace of radical Christchurch. Victoria Square is historically relevant for Christchurch - past present and into the future as a contemplative heart of the city – it is Christchurch at its best.